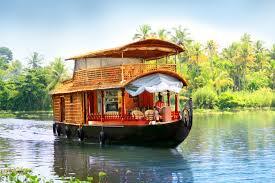 Celebrate your Honeymoon in Kerala Backwater Houseboats. A unique experience unparalleled. We receive you in Cochin Airport/ Ernakulam Rlystn, Move to Alleppey / Kumarakom Backwaters, Check in House boat at 12 noon. Experience Kerala Hospitality. Next day 9 am Check out, followed by Alleppey beach visit, Move to Cochin, Cochin sightseeing if time permits, Drop at Cochin airport / Ernakulam Rlystn. Delicious food will be cooked and served in the House boat. WE offers exclusive single bedroom House boat for your package. Celebrate your Honeymoon in Kerala backwaters. Honeymoon Candle light Dinner is asnother attraction in this tour.